We’re off to woods near our headquarters today! We’re in search of a really cool reptile! 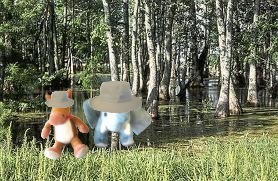 We’ll be looking in the local rivers, so grab your wellies and your hats and let’s head out on today’s adventure. 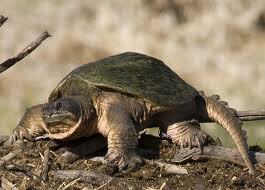 MEET THE COMMON SNAPPING TURTLE! 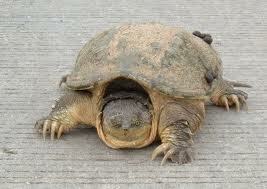 Common snapping turtles have large heads. Their carapaces are often covered in algae. Common snapping turtles often lie on the bottom of a body of water buried in the mud. The actively forage for food or they ambush prey using a small appendage in their mouth as a lure. Common snapping turtles are very territorial. 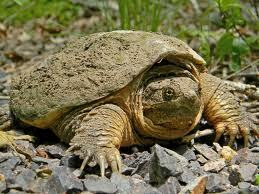 Common snapping turtles are smaller than their larger alligator snapping turtle cousins. They are pretty sneaky when they lay on the bottom on the river waiting for prey to come swimming by! SNAP! !